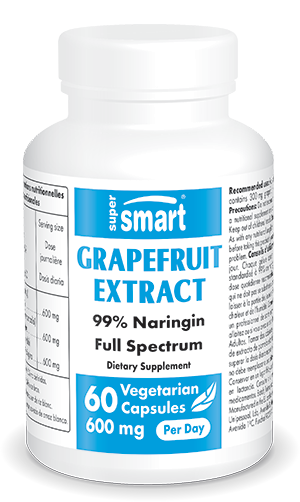 The product ‘Grapefruit Extract’ is an extract of grapefruit standardised to 99% naringin, the fruit’s main active principle. Though often conflated, pomelo and grapefruit are actually two separate species, grapefruit being the more common of the two in the West. This dietary supplement is formulated from pomelo, also known as Citrus paradisi. Obtained via extraction from the whole fruit – the pulp, seed and skin of the pomelo - the extract is then processed into dietary supplement form. In accordance with current legislation, ‘Grapefruit Extract’ is completely free from synthetic compounds such as benzethonium or paraben. This supplement enjoys an excellent reputation due to the nutritional composition of the pomelo. The fruit is rich in fibre, hence its low calorie content - and consequent popularity, like grapefruit, with those following a weight-loss diet. In addition, this extract contains bioflavonoids, antioxidant compounds known for the essential role they play in protecting the body. And finally, its most important active ingredient is naringin, a flavonoid heteroside, which gives the pomelo and grapefruit their distinctive bitter taste. Concentrated in the pith, naringin is today used in a number of products such as tonic drinks. While grapefruit extract is often recommended as part of a weight loss programme, its pharmaceutical potential has also been widely-studied by the scientific community. Indeed, researchers have identified it as a powerful antioxidant because of its flavonoid content. Grapefruit extract may therefore prevent cellular ageing by reducing oxidative stress-induced cell damage. Antioxidant flavonoids may similarly offer benefits in preventing some forms of cancer and cardiovascular problems. Scientists have also been studying pomelo extract to better understand why some consider it to be a natural anti-viral and anti-inflammatory. Though the benefits of grapefruit extract have yet to be fully established, results currently suggest it has analgesic, antiviral, anti-ulcer, neuroprotective and lipid-lowering effects. A formulation standardised to 99% active principle, ‘Grapefruit Extract’ comes in capsule form, each capsule containing 300mg of pomelo extract standardised to 99% naringin, the fruit’s main active principle. The dose recommended to fully benefit from this compound, is two capsules a day. Individuals on any form of medical treatment should first consult their therapist in order to avoid potential interactions with drugs.